Do you ever wish you could do very little and yet have a delicious dinner on the table that your whole family will love? I know I do, especially recently as my energy level seems to be decreasing significantly lately. The thought of throwing a few things in the crock pot, and letting it cook all day allowing me to do very little and still have a delicious meal, makes me one very happy Momma these days! 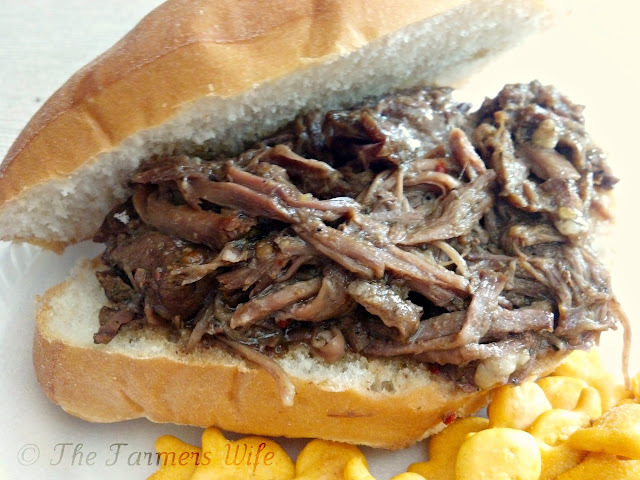 This Italian Beef recipe is just such a recipe. As most of you know I'm now in the 3rd and final trimester of my pregnancy, and I'm trying to cook meals that will freeze well so that we can still eat homecooked meals after our little girl is born, but with very little effort. I've been wanting to create a category for Freezer Meals for a long time now, and now I am! Now it has it's very own category you can search for here at The Farmers Wife! I'm really excited about this new addition, and hope y'all will enjoy this new feature too. Now back to the recipe... lol! This Italian Beef is a meal that not only tastes amazing the first day, but almost even better after being frozen and warmed back up. I love this recipe, not only for it's simplicity, but it is VERY full of flavor. And to make it even better it is kid approved! My son just LOVES this meal whenever I make it! In a 6 qt. slow cooker place the roast, pour the water around it and sprinkle in the seasonings. Cook on low for 6-8 hours. Once cooked shred the meat and add back into the pot with the juice from the meat. Serve warm on your favorite sandwich rolls. Optional* serve with extra juice on the side for dipping. This freezes well for up to 2-4 months in an airtight container. Told you it was simple didn't I? Trust me it is very full of flavor, and smells absolutely tantalizing while cooking all day! Our family gives this 5 stars! This looks really good. I am always on the look out for things that you can fix and freeze to pull out later. For something so delicious-looking, the simplicity of preparation was a nice surprise! I've got this in the crockpot now. It smells so good.